The 2014 general election was held in nine phases from 7 April to 12 May, to constitute the 16th Lok Sabha. The results of the election were announced on 16 May 2014. 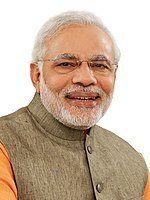 On 20 May 2014, a meeting of the parliamentary party of BJP was organised at the Central Hall of the Parliament of India and Narendra Modi was elected as its leader. Subsequently, BJP president Rajnath Singh along with other leaders of the ally parties of NDA, met President Pranab Mukherjee at Rashtrapati Bhavan and handed over the support letter of 335 members of parliament and claimed for the government formation. Following this, Mukherjee invited Modi and under the powers vested on him under Constitution of India, appointed him as the Prime Minister of India and sought his advice for the names of the members of the council of ministers of his government. On 9 November 2014, there was an expansion and reshuffling in his cabinet and 21 new cabinet ministers were sworn in. Prime Minister Narendra Modi appointed Nripendra Misra as his Principal Secretary and Ajit Doval as National Security Advisor (NSA) in his first week in office. He also appointed IAS officer A.K. Sharma and Indian Forest Service officer Bharat Lal as joint secretaries in the Prime Minister's Office (PMO). Both officers were part of Modi's government in Gujarat during his tenure as Chief Minister. On 31 May 2014, Prime Minister Modi abolished all existing Group of Ministers (GoMs) and Empowered Group of Ministers (EGoMs). A statement from the PMO explained, "This would expedite the process of decision making and usher in greater accountability in the system. The Ministries and Departments will now process the issues pending before the EGoMs and GoMs and take appropriate decisions at the level of Ministries and Departments itself". The UPA-II government had set up 68 GoMs and 14 EGoMs during its tenure, of which 9 EGoMs and 21 GoMs were inherited by the new government. The move was described by the Indian media as being in alignment with Modi's policy of "minimum government, maximum governance". The Indian Express stated that the GoMs and EGoMs had become "a symbol and an instrument of policy paralysis during the previous UPA government". The Times of India described the new government's decision as "a move to restore the authority of the Union Cabinet in decision-making and ensure ministerial accountability". Newly appointed cabinet minister Gopinath Munde, who was in charge of the Rural Development, Panchayati Raj, and Drinking Water and Sanitation portfolios, died in a car crash in Delhi on 3 June 2014. Cabinet minister Nitin Gadkari, who is in charge of Road Transport and Highways, and Shipping, was assigned to look after Munde's portfolios on 4 June. On 10 June 2014, in another step to downsize the government, Modi abolished four Standing Committees of the Cabinet. He also decided to reconstitute five crucial Cabinet Committees. These included the Cabinet Committee on Security (CCS) that handles all high-level defence and security matters, the Appointments Committee of Cabinet (ACC) that recommends to the President all senior bureaucratic appointments and postings, the Cabinet Committee on Political Affairs (CCPA) which is a sort of small cabinet and the Cabinet Committee on Parliamentary Affairs. ^ "Women Cabinet Ministers in India". 1 July 2014. ^ "Narendra Modi appointed PM, swearing-in on May 26". The Indian Express. Press Trust of India. 20 May 2014. Archived from the original on 20 May 2014. Retrieved 20 May 2014. ^ "21 new Ministers inducted into Modi Cabinet". The Hindu. 9 November 2014. Retrieved 9 November 2014. ^ Vikas Dhoot. "With key men in place, Narendra Modi PMO gradually takes shape". The Economic Times. ^ ET Bureau. "Narendra Modi abolishes all GOMs, EGOMs". The Economic Times. ^ a b Shishir Sinha (31 May 2014). "Modi Govt abolishes all EGoMs, GoMs". Business Line. ^ ' + val.created_at + ' (31 May 2014). "Narendra Modi Overturns UPA Legacy, Abolishes Ministerial Panels and Empowered Groups of Ministers". NDTV.com. ^ a b "Prime Minister Narendra Modi to shed UPA baggage: GoMs, EGoMs to be junked". The Indian Express. ^ "Modi government scraps ministerial panels". The Times of India. ^ "Gopinath Munde: Indian minister dies in car crash". BBC. ^ ISTJun 3, 2014 (6 April 2014). "Minister Gopinath Munde Dies in Car Crash – India Real Time – WSJ". The Wall Street Journal. ^ "Gopinath Munde dies in road accident". The Hindu. 27 May 2014. ^ a b "Nitin Gadkari given additional charge of portfolios held by Gopinath Munde". The Indian Express. Archived from the original on 2014-06-06. ^ "Meramaal Launches Information About Government Schemes on Its Portal". finance.yahoo.com. Retrieved 2018-12-30. ^ "Narendra Modi trims Cabinet Committees, scraps four". The Indian Express. ^ ET. "PM Narendra Modi scraps 4 Cabinet Committees, including one on UIDAI". The Economic Times. ^ 'Council of ministers' (22 April 2018). "Council of Ministers under Modi Cabinet". Indian Government. ^ "Union Council of Ministers". india.gov.in. Archived from the original on 2014-12-10. Retrieved 2014-12-10. ^ "Union Cabinet reshuffle: Rajyavardhan Rathore replaces Smriti Irani as I&B minister, Piyush Goyal gets finance ministry". Times of India. May 14, 2018. ^ "Arun Jaitley returns to office, takes charge of finance ministry". Times of India. Aug 23, 2018. ^ "Modi Cabinet rejig: Manohar Parrikar new Defence Minister, Suresh Prabhu gets Railways". Zee News. Archived from the original on 2014-11-12. ^ "Jagat Prakash Nadda replaces Harsh Vardhan as health minister". Zee News. Archived from the original on 2014-12-12. Retrieved 2014-12-14.